Two experiences led me to creating my most favorite cookie in the world. 1. As a kid, one of my top 5 candy bars to collect at Halloween was the mini Almond Joy. When my brother and I spilled our stash on the living room floor after trick or treating, he gladly handed over his Almond Joy bars, in trade for my Snickers. I loved the sticky, sweet, coconut drenched in milk chocolate and topped with a single almond. Forget the Sweetarts! I wanted nuts, coconut and chocolate. 2. 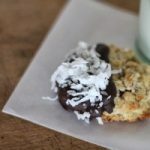 After eating (well, lets say it was more than one, less than 10) coconut cookies at two local bakeries-Ruby Snap and Sweet Tooth Fairy, I became obsessed with creating my own version of the coconut and chocolate cookies they sell. After a few tries, I came up with my own Almond Joy bar, in a cookie. If you love the Almond Joy, you’ll love this cookie. Preheat oven to 375. Or if using convection, 350. Remove butter from refrigerator and softened butter for about 20 seconds in microwave or until slightly soft. Place butter in mixing bowl and add brown and white sugar. Beat just until smooth. Add almond and coconut emulsion and eggs. Beat again just until smooth. Add the remaining ingredients to the bowl, mix just until flour disappears and ingredient are incorporated. This takes less than one minute. Scoop dough onto cookie sheets, I use a 2 inch scoop. Slightly flatten with palm of hand. Bake at 350 for about 12 minutes, or until cookies are slightly golden. Convection bake for about 8 minutes. Melt chocolate. Dip about 1/3 of the cookie in melted chocolate, set on cookie sheet lined with wax or parchment paper and sprinkle with additional coconut. -*Coconut emulsion is sold in most craft or cooking stores near the cake decorating supplies. It can also be found at discount stores such as Homegoods or TJMaxx. It can be interchanged in equal amounts 1 tsp of emulsion for 1 tsp of flavoring. Emulsion does not contain alcohol, and therefore does not cook out while baking - resulting in the intensity of flavor staying the same after baking.-I like to use whole almonds and chop them either by hand with a sharp Butcher knife, or place them in a food processor with the blade setting and pulse until chopped coarse.-you can interchange the chocolate on the inside and outside of the cookie, using either semi sweet or milk chocolate. I am not a coconut fan Si but my husband is. He would love this decadent cookie. I just might have tomake these for him. Even to a non coconut love they looks delcious. These are something I MUST make for sure–with semi-sweet chocolate. They look like the perfect treat!! I should have explained this in the post. I updated the recipe with a clarification. Hope this helps! I just found your blog via someone else's pin yesterday and immediately had to make these cookies. They are wonderful! Thanks for the awesome recipe, now I'm back to delve into the archives. Hillary, Glad you found ABK! And thanks for the report on the cookies! Isn't the coconut/chocolate/almond combo divine?! Happy Baking! I am making these now. the dough is un-real!!! I'm excited to taste the finished product. I have a question though about the dipping chocolate… what kind of dipping chocolate do you use? I use dipping chocolate from a local candy store, Mrs. Cavanaugh's. Any type of real chocolate, dipping chocolate will do. I tried both dark and light chocolate, and prefer the way the dark chocolate looks on the cookies. Happy Baking! These are dangerous! My new favorite cookie recipe. Thank you for sharing! Do the Almond Joy candy bars just go in the dough? Nina, yes! Fold right into the batter.